Item # 4716. 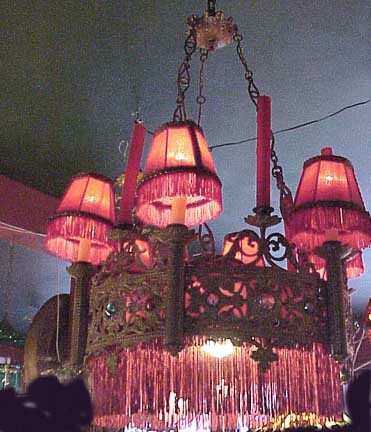 An American Romanesque Revival candle chandelier. Bronze and jewels. Fitted for electricity. 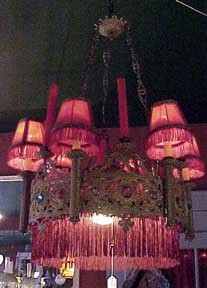 This fixture has 12 candle sockets of which 6 have been fitted with electrical candle lamps with red fringed shades + the center section has been custom fitted with a red fabric shade with red fringe. All in all there are 7 electrical fittings and 6 candle holders. The large center shade has a separate electrical chain pull. Size of the fixture: 22" diameter, 35" tall at its shortest. 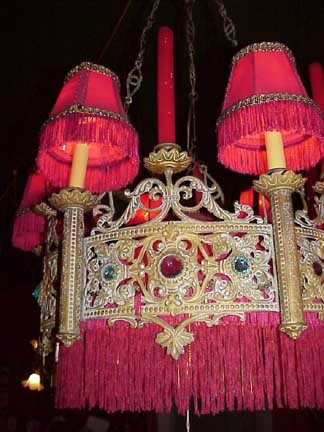 18 glass jewels surround the 'crown' element. Price: $3,950.00.